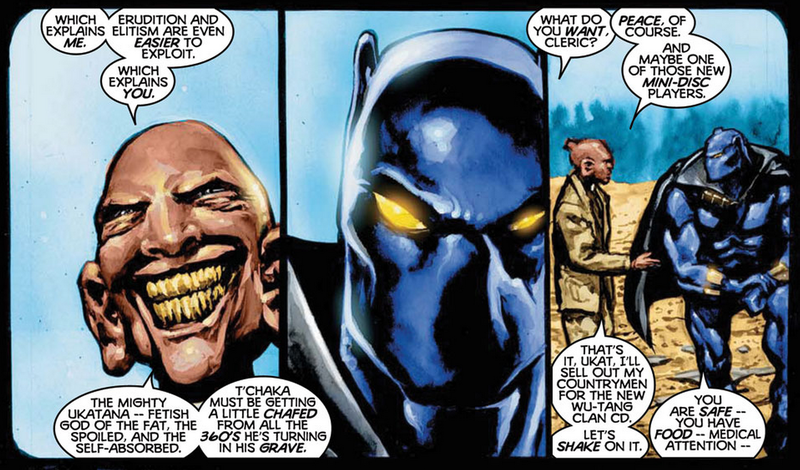 Welcome to Journey Through Comics: Priest’s Black Panther Part 3. You can read Part 2 here and you can view an index of all the segments here. The third issue of the series opens with a flashback as narrated by Ross. The sequence tells an myth-like tale of the origins of Achebe, and is juxtaposed with wonderful art by Mark Texeira. The desert landscape does a nice job of highlighting the subtext of Achebe’s back story, one in which he hunts down and butchers everyone who knew his wife, until there is no one left. T’Challa eminates a certain antipathy for Achebe in these scenes, more offended and annoyed by the latter’s persistence and the repetitiveness of his actions, than an actual hatred. The interaction here is short, but potent, highlighting the depravity of Achebe by contrasting it with the stoic poise of T’Challa. It helps that the two men are so different physically. T’Challa is an Adonis, muscular, powerful, and handsome. Achebe, on the other hand, is slim of frame, with a wide yellow-toothed grin, and enlarged earlobes that give him a hideous appearance, especially by the Western standards of the primary audience. What follows next is Ross’ recounting of his supernatural interactions with Mephisto. Having been bestowed a new pair of pants by the demon, Ross quickly attempts to remove them only to discover that beneath his pants are more pairs of pants. It seems he’s sold his soul for a good pair of jeans. After this humorous aside, the readers are treated to Ross experiencing a humiliating flashback, which Ross is quick to tell Nikki was a “timeshift,” rather than a traditional flashback or hallucination. This sequence, as well as the one of Achebe’s origins, sets the tone of the issue as the pasts of our protagonists return to haunt them. T’Challa, as Ross explains, retains his focus, and rather than rushing back to Wakanda to face Achebe, continues to pursue those in the Tomorrow Fund that had been corrupted. Ross’ narration highlights a couple of points, the first being that T’Challa comes from a land where justice is served by real punishment. As king, and thus the political and legal leader, T’Challa takes it upon himself to mete out retribution. And he does so in dazzling fashion. The second point is far more subtle, a short box of narration in which Ross admits a simple truth, “Or so I imagine. I wasn’t there.” This is the first real acknowledgement that Ross may not be an entirely reliable narrator, not necessarily due to any actual deception, but simply because Ross is relaying much of this action second-hand. 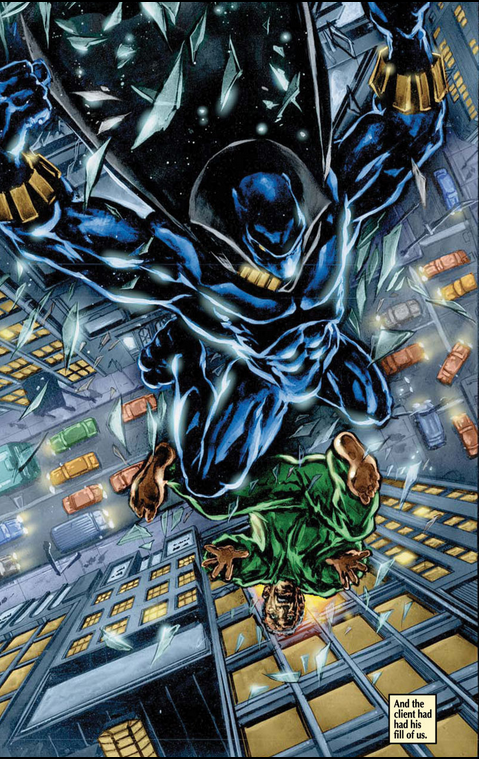 This little box emphasizes the separation between the reader and the mindset of the story’s hero, further adding to the Black Panther’s mystique. After taking Jamie’s killer to the girl’s mother, T’Challa sinks into a stoic state of self-blame. Here we discover the true reach of Mephisto’s powers; T’Challa is miles away from the apartment where Ross and the devil wait, yet T’Challa is still subject to the demon’s influence, slipping into a series of flashbacks. T’Challa is very distressed by Mephisto’s bait-and-switch, in part because he views the Dora Milaje as a ceremonial role. Nakia and her partner, Okoye, are both stated to be under the age of eighteen. While we don’t quite know T’Challa’s age at this point, his look and mannerisms suggest a man in his thirties, while his morals suggest he’s not particularly interested in the women as objects of desire. In addition, Ross’ narration makes it known that were T’Challa to declare intent – such as with a kiss – the girl he made an advance to would be forbidden from marrying any other. T’Challa’s mortification is not just because of the act, but because of what the act means for the young, impressionable Nakia. It was just in the previous issue that T’Challa reminded the Dora Milaje that they should not kill their enemies when in the United States. These are young women, susceptible to the dreams of young women, especially when constantly in the presence of a man they look up to in every way. 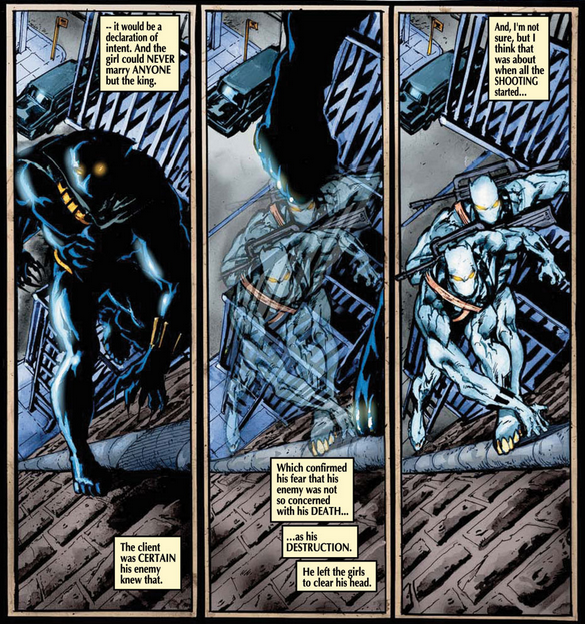 T’Challa, upset, quickly leaves the limousine to clear his head, but out of from behind him stalks a pair of ghost-like pursuers. Luvly website by d way!